Unlike many Welsh narrow gauge lines, the W&L was not concerned with slate but rather with transporting coal, lime, timber and livestock, the needs of the agricultural community centred on Llanfair Caereinon. Schemes to do so had circulated from 1862 but had proved too costly. The passing of the Light Railways Act 1896 enabled cheaper and simpler construction and operation, as well as the availability of government financial assistance. The adoption of a narrow gauge (2ft 6ins) was the final ingredient for action. The authorising Order was granted in 1899, construction began in 1901 and the line opened in 1903. As the Order required the line must be operated by an existing company, it was leased from the outset to Cambrian Railways, which in the early years lost money from the arrangement. In addition, a shortage of capital meant facilities and equipment were less than ideal. Nevertheless, traffic results were broadly as expected. Initially there were four mixed return trains each weekday, a service reduced from 1909. Grouping saw the line become part of the GWR. The rise of road transport led the new owner to establish a paralleling bus service in 1925, followed by the withdrawal of passenger services in 1931. Freight activities were then restricted to a single shift and maintenance gangs reduced. But more positively the line's two locomotives were reboilered in 1929/30. Petrol shortages during World War II reduced competition and produced increased traffic. However, the inevitable could not be delayed for ever. British Railways, successors to the GWR, soon decided on closure but delayed its implementation until 1956. The deferral may well have been the line's salvation. Since railway preservation had begun with the Talyllyn in 1951, similar ideas began to circulate about the W&L. A preservation society became a limited company in 1960 and the section from Raven Square in Welshpool to Llanfair was leased in 1962. A new base was established at Llanfair, from where services were extended to Welshpool in stages from 1963 to 1981. Whilst the two original locomotives remained, the coaches had been scrapped by the GWR in 1936. The Preservation Company was thus forced to acquire replacements, most notably from the Zillertalbahn. 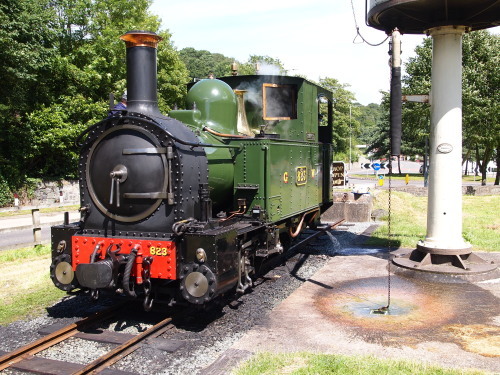 Currently the line operates from Easter to the end of October and more details can be found at Welshpool & Llanfair Light Railway Preservation Co. Ltd. After some forty five years, the Company has operated the line for longer than any of its predecessors. The Welshpool & Llanfair Light Railway A Past and Present Companion. - Hugh Ballantyne, Past and Present Publishing, 2001. Welshpool & Llanfair Light Railway A Collection of Pictures. - Ralph Cartwright, Bridge Books, 1995. The Welshpool & Llanfair. - Ralph Cartwright, Rail Romances, 2002. The Welshpool & Llanfair Light Railway. - Lewis Cozens, Lewis Cozens, 1951. Railway Magazine, July 1903. The Welshpool & Llanfair Light Railway.